Prague / Frankfurt / Washington, August 29, 2004 – Three human rights organizations have published a set of “minimum standards” that Beijing should meet in order to be a good host for the next Olympic Games. They argue that the situation in China contradicts the ideals of the Olympic Charter. If there is no progress by 2006, Olympic Watch, the International Society for Human Rights (ISHR / IGFM) and the Laogai Research Foundation will “assist the international community in finding alternative solutions”. Specifically, this coalition requests that the PRC ratify the International Covenant on Civil and Political Rights, which the Beijing government signed six years ago. Other standards cover no use of military power against peaceful democratic action, moratorium on the death penalty, democracy for Hong Kong, talks with the Tibetan government-in-exile and the abolition of slave labor camps where people are sent without a trial. Olympic Watch has earlier joined a call, by which the Chinese and Tibetan exile request that the attendants of today’s closing ceremony of the Athens Olympics not applaud to the repression in China and Tibet when the Olympic flag is passed to Beijing. Instead, they are to commemorate the victims of human rights violations through a moment of silence. The full text of the joint statement by Olympic Watch, ISHR / IGFM, and the Laogai Research Foundation follows below. In July 2001, the International Olympic Committee (IOC) granted Beijing the organization of the 2008 Olympic Games. Little progress has occurred in the area of human rights and democracy in China since, despite previous promises by the Beijing leadership. The Olympic Charter sets out “harmonious development of man” and “human dignity” as its key values. The situation in the People s Republic of China (PRC), however, remains adverse to such aspirations. Olympic Watch, the International Society for Human Rights (ISHR / IGFM), the Laogai Research Foundation therefore reiterate their commitment to assist the people in China in their strife for democratic reform and human rights. - and the end of persecution of lawyers defending workers and home-owners in courts. NO USE OF MILITARY FORCE AGAINST PEACEFUL DEMOCRATIC ACTION. China, like any other country, certainly has the right to use its military as a tool of self-defense against legitimate threats. Deploying it against peaceful pro-democracy activists, in a way it happened during the Tiananmen crackdown in June 1989, or against the democratic processes such as those underway in Taiwan, clearly do not fall under this category. MORATORIUM ON THE DEATH PENALTY. 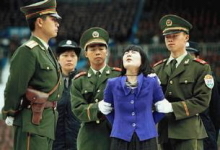 Regardless of internationally different moral views of the death penalty, it is clear that in present-day China it is used in an environment short of fair-trial standards. It is part of the oppressive apparatus of the totalitarian regime. Further, there are indications that executions are part of an industry of organ harvesting. The moratorium, matched with freedom of speech, will not only stop these abhorrent practices, but also allow the Chinese people to re-examine whether the institution of the death penalty is morally acceptable at all. OPEN TALKS WITH THE TIBETAN GOVERNMENT-IN-EXILE. The government of the People s Republic of China needs to match the good will of the Tibetan government-in-exile and enter talks with the Tibetan government-in-exile without any pre-conditions. The dialogue between the Chinese government and the Tibetan government-in-exile must intensify, with the Tibetan people ultimately choosing their future through a democratic process. The cultural identity of the Tibetan people, as well as Uyghurs in East Turkistan, needs to be respected. GUARANTEED DEMOCRACY IN HONG KONG. The people in Hong Kong have clearly demonstrated that they want the Beijing government to respect their traditional rights and liberties, such as the freedom of speech and freedom of association. Furthermore, they have clearly and peacefully requested that they want to elect their legislature and the Chief Executive through free elections. Elections of the Chief Executive and of the legislature accordingly need to be fully carried out under the conditions of universal suffrage, applying to those taking place in 2012/2013 at the latest. ABOLITION OF THE LAOGAI / LAOJIAO CAMPS. The system of extrajudicial detentions, abused for the persecution of political dissidents and adherents of spiritual movements, must be fully abolished. Torture is widespread in these labor camps and detainees are abused as cheap slave labor, underpinning much of Chinese economy. It would be truly tragic if Olympic souvenirs should be produced by forced labor in slave labor camps. It is our sincere hope that these minimum standards are met. Should the PRC authorities instead choose to continue violating human rights of the Chinese people and the Olympic ideals the world holds dear, the organizations backing this initiative will assist the international community in finding alternative solutions and other proper responses to holding the 2008 Olympic Games in an un-Olympic environment.